Erik Shinn was appointed Adjunct Lecturer of Trombone at the University of Florida in the fall of 2015. An active trombonist in the southeast United States, Erik has worked with middle school, high school, and university students across the region and has performed as a soloist, chamber musician, conductor, and with orchestras throughout North and Central Florida. Erik’s research interests are centered on trombone literature; his treatise is titled An Annotated Bibliography of Works for Solo Bass Trombone and Wind Band. Erik holds bass trombone positions with The Gainesville Orchestra and the Ocala Symphony Orchestra and regularly performs as a substitute musician with other orchestras throughout the Florida panhandle. He has also played with the Texas Festival Orchestra at the Round Top Festival-Institute (Round Top, TX) and the Taneycomo Festival Orchestra (Brandon, MO). As a chamber musician, Erik performs with the University of Florida Faculty Brass Quintet and was a founding member of the Seminole Trombone Quartet, which was named 1st Alternate in the International Trombone Association’s Trombone Quartet Competition during their 2014-15 season. As an arranger, Erik has completed works for a variety of brass ensembles, specializing in works for trombone choir and mixed low brass. 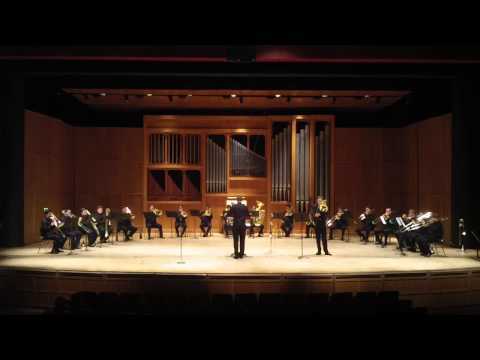 His arrangements have been commissioned and performed by professional organizations including the St. Louis Low Brass Collective, Washington Trombone Ensemble, Nittany Trombone Quartet, and the Cramer Trombone Choir of the International Trombone Festival, as well as collegiate ensembles at Baylor University, the Eastman School of Music, Florida State University, Henderson State University, Indiana University of Pennsylvania, Ithaca College, Pennsylvania State University, University of Alabama, and the University of Colorado-Boulder. Erik earned a Doctor of Music from Florida State University, Master of Music from Baylor University, and a Bachelor of Music Education from Pennsylvania State University. His primary teachers include John Drew, Brent Phillips, and Mark Lusk, with additional instruction from Brian Hecht, Gerry Pagano, John Kitzman, Lee Rogers, Grant Moore II, and Paul Ebbers. He is a member of the International Trombone Association, College Music Society, and Pi Kappa Lambda National Music Honor Society. Erik is also a member of the literature review staff for the International Trombone Association Journal.